This is a very deep and personal song to me, and it came on so strong when I was in Florida. I’d just finished it recently, and it had hung in the background. When suddenly it became so real, so much about what I was going through, that I sang it constantly. All the vague feeling that often go into a song became crystal clear, as it told her so much of what I had to say. Though I first wrote a basic starting version of this back in 2002, after meeting another lady singer who might have been the one, but wasn’t, I never really finished it, and it kept evolving with new verses and bits and pieces. I decided to finish it as well as part of getting new material ready for the recording project. But it didn’t really come alive till I found myself in this same place that had started this song in the first place, meeting someone who I would do almost anything to be with, except I can’t stop being what I am. Its all about recognizing and accepting what is real in my life. Call it destiny perhaps, or Fate, but it is as much just simple reality, and what I know is real. I don’t know much, but I know a few simple things, and I can acceptthat I don’t know more, that I don;t need to know more. 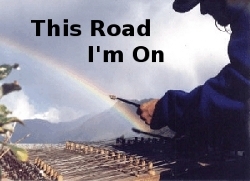 I am on this path, this life as a folksinger, playing the dulcimer, singing the songs, my priviledge, honor, and burden, and I have no choice but to do my best on this path I have been given. I am on this road that is my mission, my calling, my duty in life. It goes beyond dedication and commitment, because I can see no real choice, I am what I am, on this road I am on, have been given to walk. And if I ever find someone who is really on this same road, that’s all that matters, not where they are coming from. and I don’t know what to say, or even what I am trying to say, to explain how I got here, or where I’m going to, but I know where I am, what I am, and I accept that, because I know that much, even if I can be sure of nothing else. And if you know that this road is where you are, that is all I need to know. It is as simple as maybe I can make you smile, because I do that sometimes, and maybe you can make me smile, a harder job perhaps, its been a long time since I had someone that make me smile. And what I do, and am trying to do to her, is nothing more or less than reach through those walls we all shelter behind, to touch people’s hearts and souls, and I am reaching through to touch her, and her heart and soul and mind.. But I’m just singing songs, just singing songs. I laugh because it seems so simple and harmless, and how our culture so trivialized and commercialize such an amazing, rare, and powerful gift. So don’t worry, I come in peace and mean you no harm, as I find my way through your walls to touch your heart. I am just singing songs, after all. This entry was posted on Friday, May 1st, 2009 at 10:30 pm	and is filed under Music. You can follow any responses to this entry through the RSS 2.0 feed. Both comments and pings are currently closed.